"Blessed with a gift..."cursed" with a secret." Everybody knows Cate Cahill and her sisters are eccentric. Too pretty, too reclusive, and far too educated for their own good. But the truth is even worse: they're witches. And if their secret is discovered by the priests of the Brotherhood, it would mean an asylum, a prison ship - or an early grave. If what her mother wrote is true, the Cahill girls aren't safe. Not from the Brotherhood, the Sisterhood - not even from each other. I was not a fan of historical fiction, but I am definitely a fan now, or at least a fan of any historical fiction that is written by Jessica Spotswood! This book was fabulous, wonderful, amazing, and any other various adjectives you could think to apply. I liked the main character, Cate, from the very beginning. She's a strong girl, with just the right amount of attitude, and she does whatever it takes to protect the ones she loves. The women in this world are very repressed and some live in constant fear of being taken away as witches, whether it's true or not. Cate and her sisters, Maura and Tess, are from a well to do family and live on the outskirts of the village. Unfortunately, the way they keep to themselves, has made them sort of outcasts in the village and people tend not to associate with them. As far as Cate is concerned, that is all for the better. The more secluded they are, the easier it is for her to keep her sisters and their magic in check. Of course, nothing can stay that easy forever. With an old friend, and now possible suitor, back in town, a new governess, and sudden attention from some of the villages most popular girls, Cate has got her work cut out for her. We know right off that the sisters all have magic and that is the driving plot of so much that goes on in the story. Cate is constantly working to keep their secret hidden, so her and her sisters are safe from the Brotherhood. The last thing Cate wants is for one of her sister's to be taken away for witchery, or worse, for her to be taken from them. After receiving a mysterious note, Cate is desperate to find out more about her family's magic and it's history, but she doesn't know who she can trust to help her find out. There are so many twists and surpises involving witches and magic, you think you've sussed out one thing and then something else pops up. It definitely kept me turning pages, I just had to know what was going to happen next. I don't want to spoil the romance for anyone, but there is definite swoon as well as some kissing. I actually liked both boys that presented themselves as options for Cate. They both brought something completely different to the table and I could see her having valid reasons for choosing either one of them. Paul has known Cate her whole life and it he seemed very genuine in his interest in her. He has a solid job and could provide a good life for the two of them. Finn is less stable in what he is able to give to Cate, but what he lacks in stability, he makes up for in desire. His interest in her wasn't anything practical, it was all feeling. I've been wanting to read this since I first heard about it, but I wasn't aware there's a love triangle O_O I'm glad I know to borrow it instead of buy it now. :P (I hate love triangles.) Great review! Ohhhh I can't wait to read this one!!! Great review, I can't wait to get my hands on it!! I'm really looking forward to this one! It sounds amazing. Great review! This book sounds so good. Sometimes historical fiction gets too detailed for me so I'm glad to hear that you had no problem with the historical part. I haven't read a story about witches in a long time, so I might have to pick this up. By the way, I really like your writing and you reviewing style. I'm so glad you liked this! (I read your review as soon as you posted it, and have kept it marked as unread in Google Reader so I would remember to comment on it because I enjoyed reading your review so much.) Thanks for posting the trailer, too- I hadn't seen it yet! This book sounds amazing. I have never really been able to read historical fiction books, but I think I will give this one a shot! Great review! This book is on my to be read list. I love witchy books, and this one seems like it has a great story line. All the twists and turns are bound to keep me entertained and trying to guess what will happen next. Great review! I actually just picked up my copy a couple days ago. I can't wait to read it!!! Sounds rather interesting and lives up to the expectations created by the fascinating cover. Even more better that it is actually a historical fiction:) Thank you for giving detailed review! 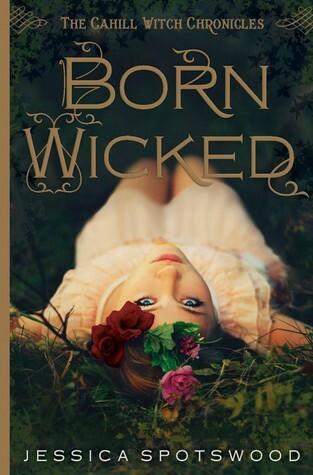 Born Wicked is added to my TBR list. This book sounds pretty awesome! I've wanted to read this book for a loooong time!